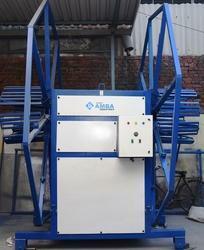 Being a leading enterprise of this industry, we are offering a huge range of LDPE tube coiler machine. We are enlisted as top company involved in manufacturing a comprehensive range of Semi Automatic Coiler. These are robustly constructed using high grade material and latest technology by our skilled professionals. 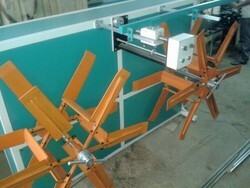 We are the manufacturer and exporter of Industrial Recoiler Machine. we are leading manufacturing and supplying for Recoils. Model SEL/97/IV SEL/97Drawing Capstan Dia. 1000 mm 600 mmINLET WIRE ROD 0 0High Carbon 8 mm 8 mm to 2 mmMild Steel Wire 8 mm 6 mmAluminium Alloy(6201) 9.5 mm 6 mmCopper E.C. Grade 16 mm 8 mmDrawing Final Speed 100 mts./mm 100 mts/mmHP Reduction Area 2 to 3 % 2 to 3 %Type of Machine Noslip NoslipCapacity 1300 Kgs. 600 Kgs.Space Required 12" x 10" 8" x 10"
The machines offered by us possess the capability of offering accurate results and performing every task efficiently.